Traders using scalping techniques are always trying to get profits from small price movements in the market that always occur throughout the day. Trading methods and forex indicators for scalping are also typical. Fundamental analysis varies and this news is rarely influential for scalpers. Therefore, experienced scalpers usually have their own systems that are powerful and reliable, consisting of technical indicators with default or customized settings. 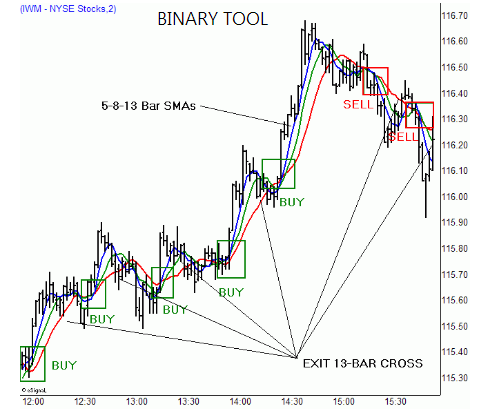 Well, here are some forex indicators for scalping that are widely used, and can be considered as some of the best "tools" for compiling your trading system. As one of the simplest indicators available on all trading platforms, the Moving Average is a favorite index for many scalpers. Placement and use are also very easy for beginners. Traders simply specify a timeframe for trading, put a combination of several Moving Averages lines, test their reliability, then operate. Master Trader Alan Farley in a column at Investopedia recommends a combination of SMA 5-8-13 on the 2 minute chart to identify trends that are strong enough to buy or sell, while reviewing when the trend is about to reverse. Put the Moving Averages on the chart, you will see the SMA lines fluctuate. When the trend is still strong, it will stick to the 5 SMA or 8 SMA, whereas if it approaches the 13 SMA it means that the momentum has faded and a reversal will occur (when it closes). Next, wait for the lines to reunite before opening the position again. Use one of the classic formulas Moving Averages: If a lower MA crosses the high MA towards the top, open buy; whereas if a lower MA crosses the high MA towards the bottom, then open sell. Many other Moving Averages combinations. Some "married" SMA-60 with Parabolic SAR default settings, or trio EMA-12, EMA-26, and 55-SMA. And so forth. The disadvantage of using an MA is the possibility of a fake signal that is high enough, so it's good to always be ready to square off if the price turns in the wrong direction, or complete it with another indicator as a confirmation. 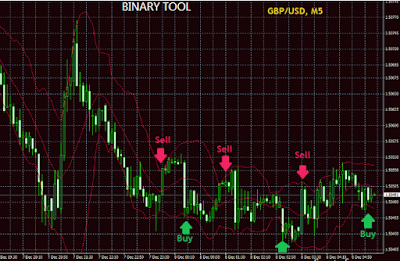 Bollinger Bands at low timeframes are also popular as forex indicators for scalping. Simply apply Bollinger Bands with period 12 and Deviation 2 (default) on the timeframe 5 minutes, then run. If the price touches the lower band, buy; then if the price reaches the upper band, then sell. Put a stop loss gap and a thin TP only, between SL: TP = 10: 5 pips. However, there is no system without weaknesses, including the Bollinger Bands indicator. This one forex indicator will only be effective on the market ranging / sideways, and can be disastrous when used when the price is trending. The problem is, Bollinger Bands often fail to detect the penetration of one band, even though it can easily make our position hit by SL because of the low SL level. 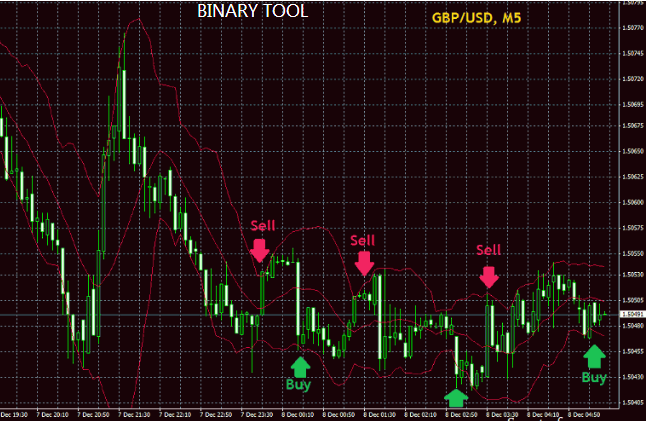 The use of Stochastic as a forex indicator for scalping is somewhat different from Moving Averages or Bollinger Bands. Most traders use Stochastic not alone (single indicator), but as a complement in one system. So, you can often see system recommendations where Stochastic is combined with Moving Averages, or Bollinger Bands, and so on. 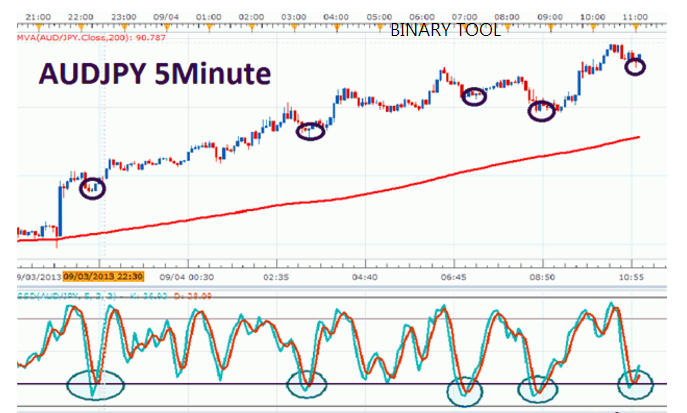 One scalping tip while following the trend of DailyFX is by combining Stochastic with 200-SMA. SMA-200 is often regarded as a demarcation line that limits between bullish markets (prices are above the line) and bearish markets (prices are below the line). 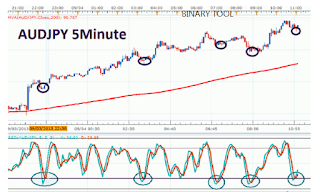 So, attach SMA-200 to the 5 minute timeframe, then apply Slow Stochastic (5,3,3). For example, the market is bullish, so look for buy signals from the Stochastic crossover to open a position. Conversely, if the market is bearish, then look for sell signals. Of course, you need to pick and choose which currency pairs appear to be active enough and tempting to be scalped this way. There are many others that can be used as forex indicators for scalping, such as the CCI indicator. There are even Scalpers who dare to trade naked, aka trading without indicators, just by observing the price action and candlestick patterns. The equation between all is only one: applied to a low timeframe, between 1M, 5M, and a maximum of 15M. Whatever indicators are used in the system, an important point to look at is that traders need to test before using real trading. There are a lot of scalping systems out there, one reason is because not every system is suitable for everyone. Capital, money management, and trading habits of every person can also affect the success or failure of scalping.